New York, N.Y. – July 12, 2012 – Nominations for the 33rd Annual News and Documentary Emmy® Awards were announced yesterday by the National Academy of Television Arts & Sciences (NATAS). The News & Documentary Emmy® Awards will be presented on Monday, October 1 at a ceremony at Frederick P. Rose Hall, Home of Jazz at Lincoln Center, located in the Time Warner Center in New York City. The Wereth Eleven earned a nomination in the promotion category for our compelling trailer that editor and co-exec. producer Frederic Lumiere and I labored over for at least three 18 hour sessions. I remember quite well finishing this trailer around 1AM in the morning and Frederic and I both toasted it's completion with a beer (maybe two). It is very gratifying that our work has been recognized as among the very best by industry standards and I believe this will bring even more attention to the film. 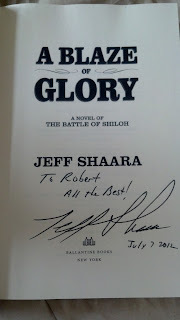 While in Gettysburg I was able to chat for a few minutes with Jeff Shaara and pick up his new book. It looks great and can't wait to dive in. He said that he has gotten a tremendous amount of email regarding returning to write about the Civil War. He said more than one fan has said, "Welcome back!" I was in Gettysburg to help promote next year's 150th film. There was great interest in all things 150th. I even signed a few DVD's for folks. All were in good spirts- despite the record heat. In fact on my way back to town at 6:30P I glanced at the car thermometer and it read 105 degrees! Nothing like Gettysburg in heatwave - you have to experience it to believe it. Several weeks ago I started writing a new story, The Russian van Gogh, first in a new series featuring female Forensic Art Detective, Dr. Riley Spenser. She is both an Art History Professor at Harvard as well as a stolen art investigator handy with a gun. In this first book a secret Russian art warehouse is breeched by a terrorist branch of the Russia Mafia and several masterpieces that the Red Army looted from Berlin in 1945 are taken. Among the treasured secret pieces is a van Gogh thought destroyed in an allied bombing raid. It is worth over 300 million and Riley along with an agent from MI6 must chase down the painting before the Russian government can locate and destroy it and wipe away any evidence of their vast hidden collections of stolen artwork that rival the Louvre. I am very excited by this new international thriller series and this new character and I have included an excerpt from the book below. Early on in the story Riley is giving one of her many talks on stolen art and this scene provides clues to what will be coming later in the story. A tall, attractive blue eyed woman, 32, with long dark hair, classic features and ample curves moves confidently across a stage casting a shadow on a projector screen. She has a man intimidating educated air coupled with approachable all-American good looks. A study in contrast she is Harvard Art History Professor and Forensic Art Detective, Riley Spenser and she moves a red laser pointer to the screen. On screen a painted seascape is illuminated. The words below the painting reveal it as a Rembrandt with the title, Storm on the Sea of Galilee. Above the painting is a dollar figure, $500 Million. Professor Spenser exits to audience applause and is quickly speeding north in her Audi on Memorial Drive alongside the Charles. *Stay tuned for future book excerpts and updates in this new series. This is the first in as series of posts for this Patriotic Week in America. Over the past year I wrote and directed two military films, The Wereth Eleven and USS Franklin: Honor Restored. These are two very different films which both illustrate the heroism in the American soldier and sailor. And what I have noticed is so many people who have watched both films really lean towards the Franklin. 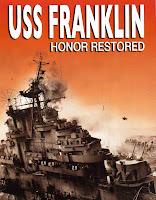 Their comments back are very gratifying as the whole mission of the film and the title speaks to it was to "restore honor" to the men who served aboard the ship. You see this film depicts an injustice that was not well known or even talked about outside Navy circles but it was what drew me to the story. When Joseph Springer and Joe Small asked me to do film I said alright but I have to tell the story of Captain Gehres - no holds barred. And all agreed. In March 1945 the Carrier USS Frankin was sailing under 50 miles off the coast of Japan. And it made a very enticing target for Japanese dive-bombers who were sent out in waves to sink the prize of the fleet. 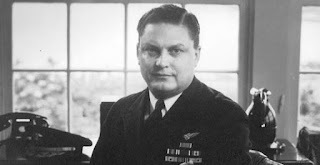 Piloting the Essex-class ship was Captain Leslie Gerhres and one look at his photo and the footage of him aboard ship and you can tell he had a lofty opinion of himself. Early on March 19, 1945 reports began flooding the Franklin from nearby ships that Japanese zeros were headed their direction. But Captain Gerhes for some reason that was known only to himself did not put the ship on full alert. In fact the carrier was sailing at a condition that was similar to cruising off the coast of San Diego. General Quarters was not called and hundreds of men were actually below decks having breakfast in the galley when a single Japanese dive-bomber cut through the clouds and dropped a dead center strike on the flight deck. The bomb was so deadly that it not only blew out three decks and smashed the galley deck up flat against the flight deck but it set off a chain reaction of hundreds of explosions of the ship's own bombs. It was a massive catastrophic strike. Sailors were literally blown over board 90 feet into the freezing Pacific and those that had no choice being either surrounded by fire or cut off by parts of the blown apart ship jumped into the 50 degree water. Once rescue shipped started coming along side the burning carrier the men who could crawl scrambled off the ship. Many others were carried off both wounded and dead. 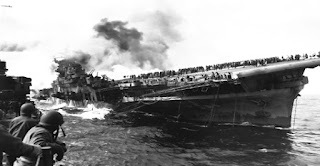 Once the explosions on the ship subsided and the fires were under control the carrier went under tow back to port. But even before reaching Hawaii rumors began circulating that Capt. Gerhes planned to charge the men who left the ship under their own power or otherwise with desertion. Desertion is a very serious charge in the military and the penalty is death. He issued a letter to the men who left the ship demanding an explanation in writing. It was unprecedented in Naval history that a Captain would charge his own crew with desertion but this is exactly what he did. Many believed later that it was a tactic to shift attention away from his own failure to put the crew on battle ready high alert status. Gerhes pursued this course all during the time the ship sailed back to Brooklyn for repairs and he did not drop his charges. 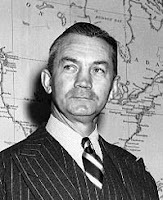 Finally the situation reached the attention of the Secretary of the Navy James Forrestal who put an immediate end to the court martial. The anguish of being labeled a deserter by your own Captain was a burden these Franklin vets had to carry the remainder of their lives. And in interviewing the surviving men for the the film it was readily apparent the pain had not lessened in more than the sixty years since the disaster. And for many having the story finally told meant as one veteran put it to Joseph Springer that, "he could now die in peace". That, in my opinion, is what makes this film resonate. It finally "restored honor" to men who desperately needed it. And all of us on the production are proud that we were able to finally give some solace to these American heroes. 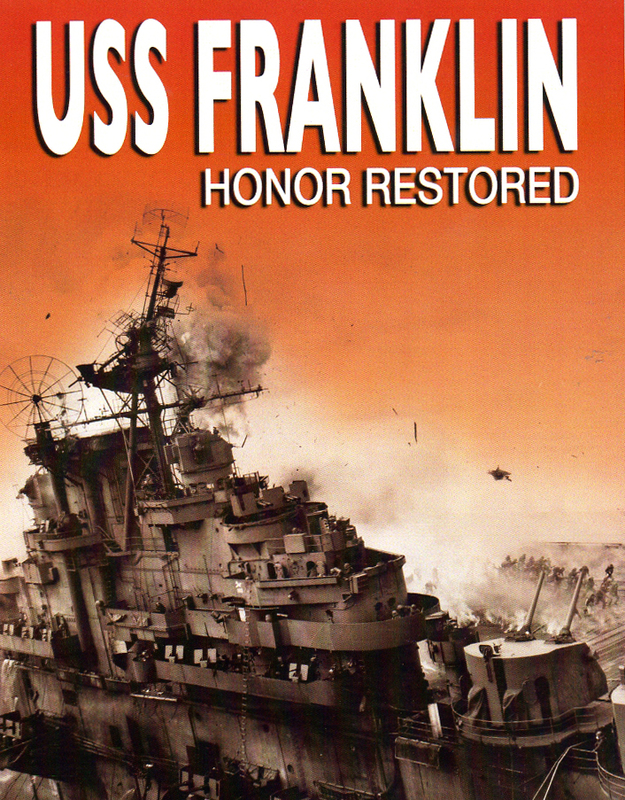 USS Franklin: Honor Restored is available just about everywhere on DVD and streaming platforms including Amazon Instant Video and Hulu. Here is a link to purchase the DVD on AMAZON.